Last year, Google announced that it would be making standalone Daydream headsets with the help of HTC and Lenovo. While HTC might have bowed out of the agreement, Lenovo is definitely still in it, as we could already see from its FCC filing last month. Now, at CES 2018, we finally get to see it in person. Say hello to the Lenovo Mirage Solo, the first ever standalone Daydream headset. And I got to try it out. As mentioned, instead of being powered by a phone or a PC, the Mirage Solo is an all-in-one device. It's powered by a Qualcomm Snapdragon 835 processor, it has 4GB of RAM and 64GB of storage. There's even an microSD card slot, which is handy if you have a VR camera and want to quickly check out what you've shot. You'll need to wear headphones in order to hear audio -- there's no speakers here -- but thankfully there's a 3.5 mm headphone jack on the side. It also has a 5.5-inch display with QHD resolution, which, yes, does produce really nice colors and produces sharp, clear, images. Yet, I did experience a slight screen door effect where the quality wasn't quite as smooth as I had hoped, especially when watching videos. 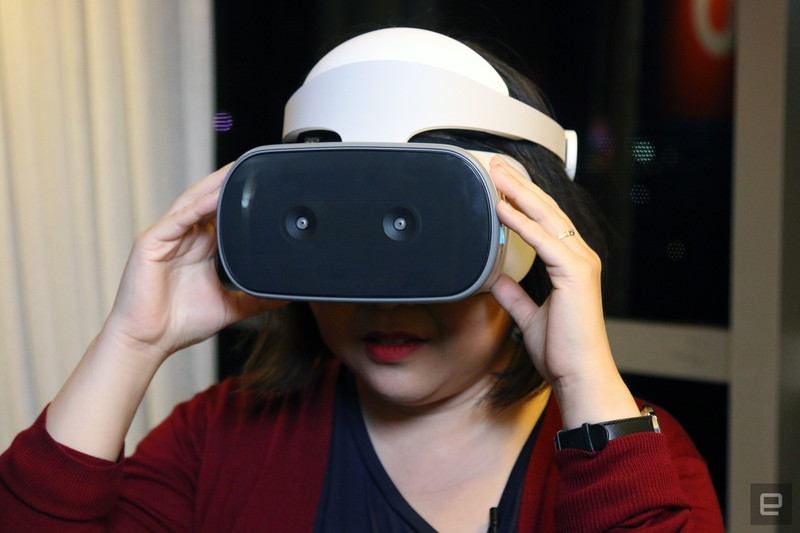 It's definitely still better than most other phone-based VR headsets I've seen however, and there's always a chance that Lenovo could tweak a few things prior to its launch to improve matters. There's a really wide 110-degree field of view. Importantly, the Mirage Solo is also the first Daydream headset that incorporates Google's WorldSense technology that doesn't require external cameras or sensors for positional tracking. Indeed, the Mirage Solo actually has six degrees of freedom, letting you dodge enemy fire and duck behind virtual barricades like you could with an Oculus Rift or a HTC Vive. Oh, and by the way? Dodging bullets is way easier when you don't have to worry about tripping over a tethered cable. Another nice bonus of wearing a standalone headset instead of a phone-based one: you'll never see those annoying text message notifications interrupt your gameplay. While Google's phone-based VR headset is small and lightweight, the Mirage Solo definitely isn't. Measuring 8.03 by 10.61 by 7.08 inches and weighing in at 1.42 pounds, the headset will definitely take up serious footprint on your living room shelf. Instead of soft fabrics like the original Daydream headset, the Mirage Solo is constructed out of a high-quality plastic, with telescoping sides and quick-release buttons placed throughout for easier adjustability. To wear the Solo, you put it on like a backwards baseball cap, placing the large brace-like shell around the top of your head. Then, you tighten it by turning a ratcheting wheel at the back. From there, you can adjust the goggles nearer or further away from you by hitting a button underneath the headset. I thought it was pretty easy to put on, even while wearing my glasses. That said, I had to shift the headset around a few times so that it would fit nice and snug around my head. At first, I was a little afraid that I would ratchet it too tight and the headset would slip off my head, but I eventually got the hang of it. You might think it would feel heavy on your head, but Lenovo has engineered the headset to be evenly load distributed so that the front of the headset doesn't weigh you down. And I have to say that Lenovo did a pretty good job here — after the initial adjustment period, the headset felt pretty secure and didn't feel too heavy at all, even as I was ducking and dodging around. What added to the comfort is the contoured padding along the insides of the headset. Truly, they felt luxurious. As for battery life, it comes with a 4,000 mAh battery which Lenovo tells us should last you a solid seven hours of gameplay or video viewing before it needs to recharge. It comes with the standard Daydream controller as well. Lenovo also announced a VR180 Mirage Camera, which works really well with the Solo -- just pop in the microSD card from the camera to view your very own VR content. Though Lenovo wouldn't confirm the Mirage Solo's final price, it did say that it'll cost under $400. That seems a little expensive, but bear in mind that you don't need a phone or a PC to use it and it's perhaps the cheapest 6DOF headset you can get. Availability is set for the second quarter of this year.